Has your Facebook News Feed become a mess of political stories, unwanted videos and angry rants? Are you wishing for the days when your feed was filled with posts from friends you care about the most? The good news is that you can fix your Facebook News Feed to show more posts that interest you and fewer that do not. By taking just a few minutes to fix your feed, you may be able to enjoy Facebook again. No need to unfriend anyone. Just set your feed to see what you want to see and hide what you do not want to see. Facebook lets you choose which friends' posts show at the top of your News Feed. Maybe you have dear friends who do not post often, but you want to be sure you see their posts first. Or maybe you have Facebook friends you have never even met in real life but they post interesting quotes or fun travel photos you look forward to seeing. 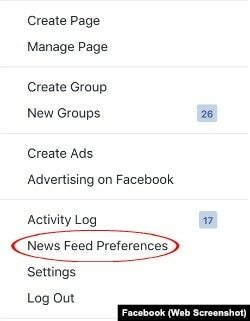 You can easily choose whose posts you want to see first by changing your News Feed settings. On the Facebook website, tap the Down arrow in the upper right corner of the blue bar at the top of the screen. 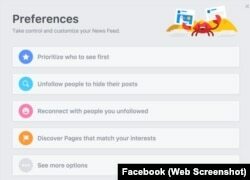 Then, choose "News Feed Preferences." Then click on "Prioritize who to see first." Choose the names of people whose posts you want to see at the top of your News Feed. The final step is to click "Done" at the bottom. You may be best friends with someone in real life but have no interest in their Facebook posts. Maybe they post angry messages or childish videos. Facebook lets you secretly block friends' posts from your feed.No one will know you blocked them unless you tell them. The process is simple. Tap the Down arrow in the upper right corner of the blue bar at the top of the Facebook page. Then, choose "News Feed Preferences." Next, choose "Unfollow people to hide their posts." Then, mark the friends you want to unfollow. This will prevent their posts from appearing in your News Feed. Some days are best forgotten. But Facebook might remind you about those bad days with its ‘On This Day’ feature. ‘On This Day’ can be a wonderful reminder of happy events. But sad anniversaries may be difficult enough without Facebook reminding you about them. You can choose people and dates you do not want to be reminded of. 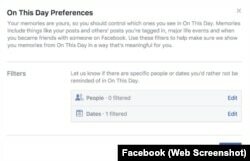 Facebook lets you choose individual dates or a wider period. 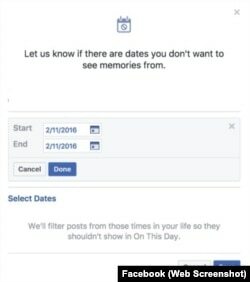 If you do not want to see any ‘On This Day’ reminders ever, choose a period from the day you joined Facebook to a date in the future. If you do not want to see political posts, you can add an extension to your Chrome browser. 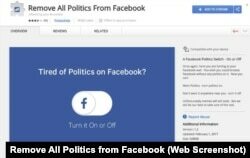 The extension ‘Remove All Politics from Facebook’ was started during the U.S. presidential campaign last year and was updated earlier this month. This extension for Chrome looks for keywords related to U.S. politics. Then it blocks posts containing those words from your Facebook News Feed. You cannot change the keywords that are blocked by the extension. After the extension has been added, click its icon in your Chrome toolbar. 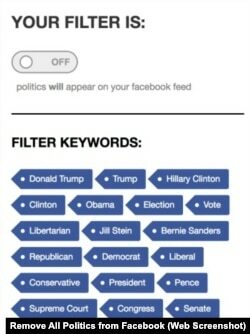 You will see a list of keywords that will cause a post to be blocked from your Facebook news feed. To start using ‘Remove All Politics from Facebook,’ slide the switch to on and restart your Chrome browser. Do you want to fix your Facebook feed? Will you be setting your friends to see first? Will you be blocking any friends' posts?